Robert Ross, my dad, published this book in 1978. It earned the highly prized Edgar award from the Mystery Writers of America for an author’s first novel. It is now available on Kindle. In A French Finish, a retired Harvard art historian, Professor Emeritus Lewis Tewkesbury, with time on his hands, agrees to a crazy caper dreamt up by one of his former students, Nick Otter. Their audacious scheme: Create a perfect replica of King Louis XVI’s writing desk from the 18th century, build a bullet-proof back story concerning its ‘discovery’, and sell the forgery at auction to an unsuspecting buyer for millions. 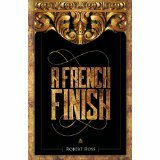 With a plot possessing more twists and turns than a woodworker’s drill bit, “A French Finish” combines insights into the arts of forgery along with ample dollops of art history, colorful characters, humor and high-jinks. Before turning to writing novels, Robert Ross was a creative director at the Leo Burnett advertising agency. When he retired to Montserrat in the West Indies, he became fascinated with Leonardo da Vinci and learned everything he could about this brilliant inventor and artist and his era. 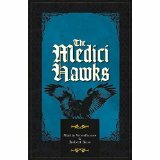 On the island, he met Martin Woodhouse, creator of The Avengers television series, and they teamed up as co-authors to pen three adventure novels: The Medici Guns, The Medici Emerald and The Medici Hawks. 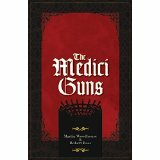 Each historical novel is set in Renaissance Italy with Leonardo Da Vinci cast as a kind of James Bond, utilizing one or more of his actual devices, from cannons and flying machines to submarines and other innovations, to solve a host of swashbuckling challenges and romantic escapades. His last novel, ”A French Finish,” won the Edgar Allan Poe Award for the best first mystery by a new writer in 1978. 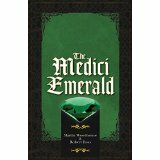 This entry was posted in A French Finish, Martin Woodhouse, Mystery series, Robert Ross, The Medici Emerald, The Medici Guns, The Medici Hawks. Bookmark the permalink.